Liam Gallagher got a bit shirty performing a new version of Manchester City anthem Blue Moon. The star crooned his way through the terrace favourite merged with his band Beady Eye's new single, The Beat Goes On, and tried on the club's new kit in a promotional video released today. 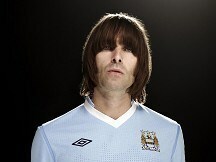 Liam said: "I've been a City fan since I was a kid so to be involved with the launch of a new kit is colossal. Manchester City fans are known for having a lot of style and the new shirt looks mega." The new shirt, in the club's traditional sky blue, includes a soundwave stitched in to it representing the noise made by fans singing the song during a game. The song, which was written by songwriting duo Rodgers and Hart, has been recorded dozens of times by stars including Elvis Presley, Sam Cooke and Frank Sinatra. Liam said: "Blue Moon is a top tune and has been City's song for as long as I can remember. It's been covered by loads of people but the only good one until now was the one Elvis did. I hope the fans buzz off our version and sing along to it at the stadium."